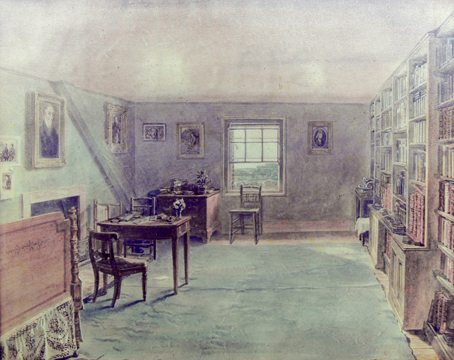 1823 Moves with the Gillmans in autumn to The Grove, Highgate. Christabel, Kubla Khanand The Pains of Sleeppublished in a volume by John Murray. The first of three projected Lay Sermons published. 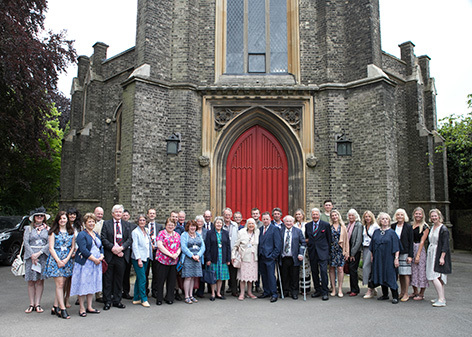 This day was an unusual mixture of Coleridge family reunion, memorial service and celebration. The idea evolved considerably over time and the Friends of Coleridge were delighted to be able to help in this process. Drew Clode, the organiser, deserves warm congratulations for his energy and commitment in bringing this day to successful fruition It is hoped that the event will provide the impetus to help raise the money to preserve the five coffins and enhance the entombment of ST Coleridge, his wife, his daughter, his nephew, who was also his son-in–law, and Herbert Coleridge, his grandson. The Rev Kunle Ayodeji, Vicar of St Michael’s,welcomed the many people present. Most of the three front pews on either side of the aisle were filled with Coleridge family members. This was a highly impressive turn out and is clear evidence of great pride in the family name. Richard Coleridge, the poet’s great-great-great-great grandson spoke about the honour and the responsibility of carrying the name. Later in the day Rosemary Coleridge-Middleton, the poet’s great-great-great granddaughter also spoke listing the many connections to the family tree with entertaining enthusiasm, anecdotes, and sense of responsibility for upholding the name. Sir Paul Coleridge, formerly a High Court Judge and distinguished family lawyer, gave an urbane and fluent televised greeting, congratulating the initiative and hoping “Reclaim the Crypt” would be successful. I encouraged those present to support the Friends of Coleridge and then introduced Rev Dr Malcolm Guite, poet and Chaplain of Girton College Cambridge. He gave the first of the two plenary lectures and chose Coleridge: A Life in the Church as his topic. He focused on Coleridge’s lifelong devotion to prayer, and gave a powerful Christian reading of The Rime of the Ancient Mariner. He quoted memorably from the Marginalia and Biographia Literaria and read his own poem about visiting the Church and being transfixed by the tombstone’s invocation to “Stop, Christian”. 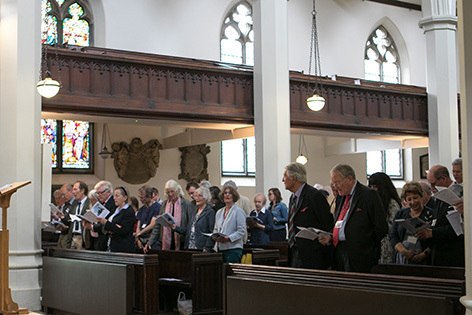 The short service which followed enhanced the Christian context of Coleridge’s work and featured the impressive choir and organist of St Michael’s, who later performed music specially written for the re-interment as well as other pieces performed at the 1961 ceremony. Coleridge’s verse was not omitted. Lance Person gave a dramatic reading of Frost at Midnight andKubla Khan, while the Friends’ own Ian Enters read from some of the late, less familiar works and briefly related them to those of Keats, Shelley and Hopkins. The Friends’ newly appointed Patron, Prof Seamus Perry once more generously gave of his time and talent. 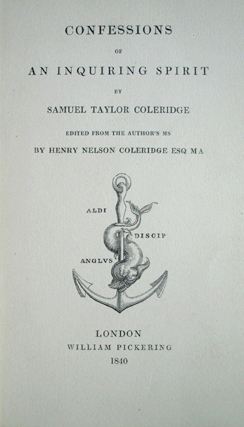 His deft and entertaining plenary on Coleridge in Highgate conveyed a portrait of the poet as talker, drawing upon his own research into contemporary accounts of meetings with Coleridge, including a memorable anecdote about Coleridge exchanging metaphysical pleasantries with local boys, amongst whom he was, apparently, something of a favourite. 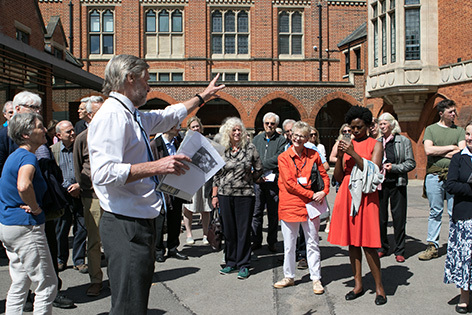 The tour of Highgate in the afternoon included a guided visit to both the crypt under St Michael’s, where Coleridge now lies, and the site of his original tomb, which was in ground now occupied by Highgate School buildings. Both were interesting and made concrete the need to improve the current arrangements. The Highgate Literary and Scientific Institution put on a special display of Coleridge related material. And in St Michael’s itself there was a temporary small exhibition, including fascinating original letters, and portraits. Boards, beautifully designed by Terence Sackett and written by Ian Enters, described Coleridge’s life in Highgate, the Church, and in Literature. The day was constantly interesting and engaging and it was very well organised, including an excellent buffet lunch. 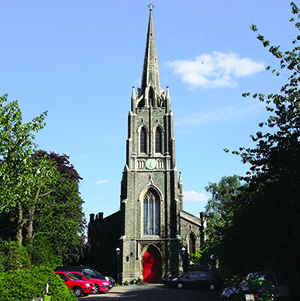 All enjoyed the event and the walking through Highgate itself in a magnificently, bright, warm summer’s dayenhanced the experience. There was plenty of warmth left in the sun when several of the Friends met up to discuss the day in The Flask, one of Highgate’s great institutions. On 25 February 2019 Dr Philip Aherne gave an outline of a book he has recently published on Coleridge's latter days in Highgate, and the spread of his influence in the United States throughout the nineteenth and twentieth centuries. 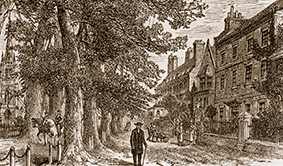 Dr Aherne, who teaches English at Highgate School, began his talk with a consideration of Coleridge's biography, outlining why he moved to Highgate and explaining that the initial impetus for moving in with the Gillmans was to seek relief from his opium dependency (which they considered to have been successful). He then moved on to lay out the programme of education apparent in Coleridge's later works before considering his fame as a talker. Dr Aherne also examined how aphorism played a vital role in shaping Coleridge’s philosophy - a philosophy centred on a process or method of thinking as much as any particular creed. After a brief consideration of Coleridge's intellectual relationship to Locke and Kant - and the respect for him displayed by the English philosopher John Stuart Mill - the talk was brought to a close with an assessment of how young American thinkers were very receptive to his intellectual method.